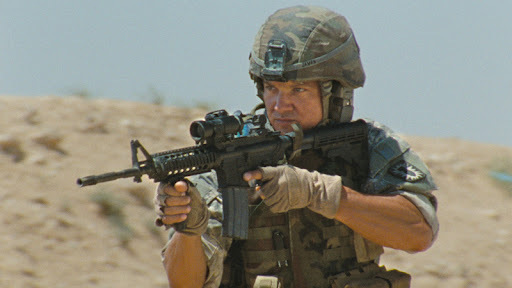 The Hurt Locker has been hailed as the best war film ever, earning nine Academy Award nominations including Best Actor for the virtually unknown Jeremy Renner. It was eventually awarded six Academy Awards including Best Motion Picture of the Year, Best Director for Kathryn Bigelow and Best Screenplay for Mark Boal. 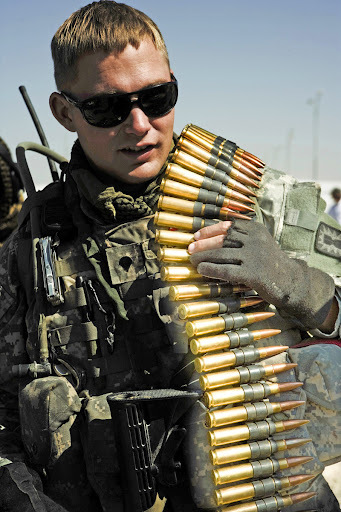 Boal was a journalist embedded with a US bomb squad in Iraq in 2004 and he based the story on his own experiences. 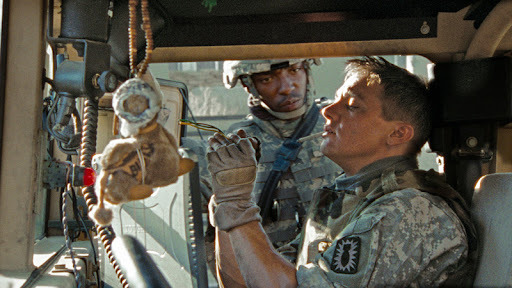 The film had all the necessary credentials but does The Hurt Locker live up to all the hype? 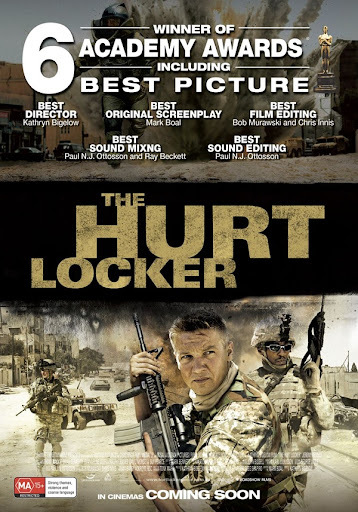 The Hurt Locker is about an elite three-man United States Army Explosive Ordnance Disposal team and the film opens in Baghdad during the Iraq War. In the opening scenes, the unit is called out to investigate a suspicious road-side package and they send in their robot. 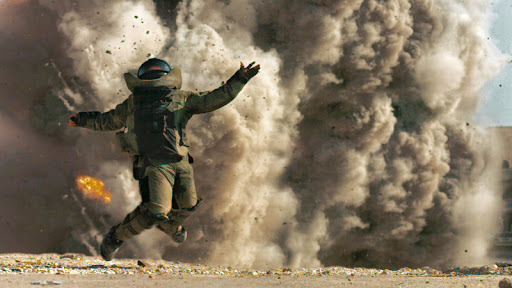 When the robot gets entangled and fails to extract the bomb, Staff Sergeant Matt Thompson (Guy Pierce) dons his bomb suit and moves out to the package. 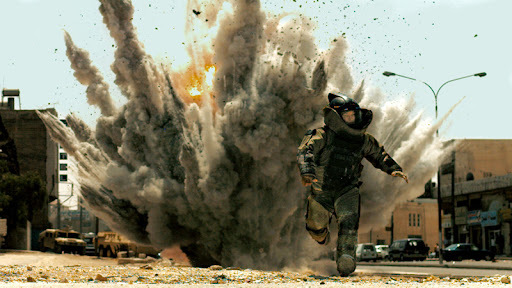 In one of the most tense opening scenes in movie history, the device is detonated and Thompson killed. This sets the scene for the arrival of Sergeant First Class William James who takes over as leader of the crew. 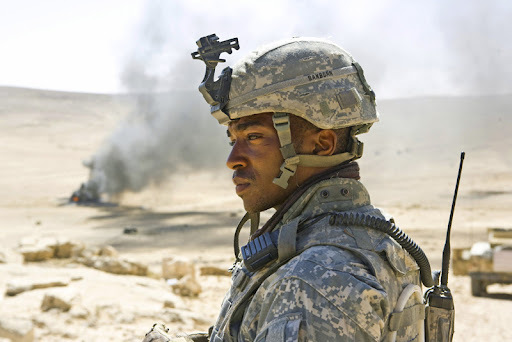 From the onset, it is clear to Sergeant JT Sanborn (Anthony Mackie) and Specialist Owen Eldridge (Brian Geraghty) that James is a maverick and a liability on the team. Getting off to a dangerous start, James descends into increasingly dangerous patterns as he begins to put more pressure on his team and exposes them to ever increasing risks. 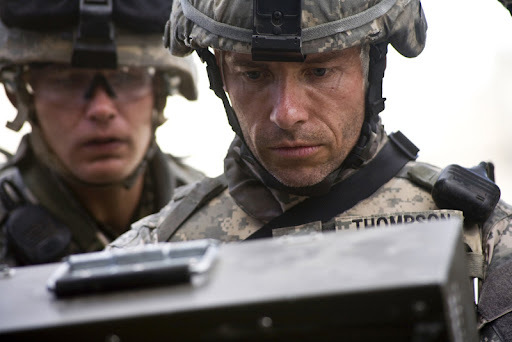 As the unit embarks on one surreal mission after another against a backdrop of the insanity of this war, it is clear that Sergeant First Class William James is descending into addiction: an addiction to war. Sanborn and Eldridge have to measure their need to trust their team leader against his suicidal methods and lack of respect for the their safety or his own. It seems impossible to reduce this film to such a simple synopsis because it is not that simple. 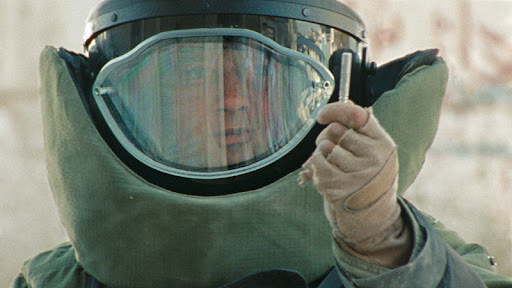 Above all else, The Hurt Locker is astounding for its realism and impact. I found it impossible to tear my eyes away from the screen and this is a film that you experience rather than watch. It took my breath away at times and you literally sit on the edge of your seat and absorb every feeling of dread and horror. Rather than tell a story the film lets the story tell itself with subtlety and sensitivity. 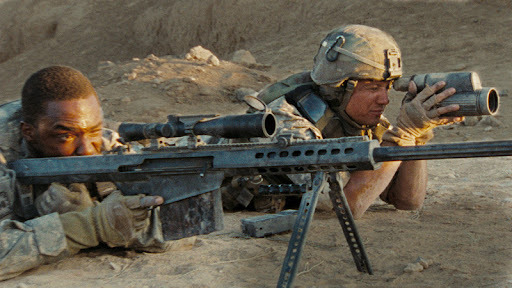 I do think this is the best war film I have seen in years (and I do consider myself to be a fan of the genre). It was powerful and gripping yet did not glorify war. 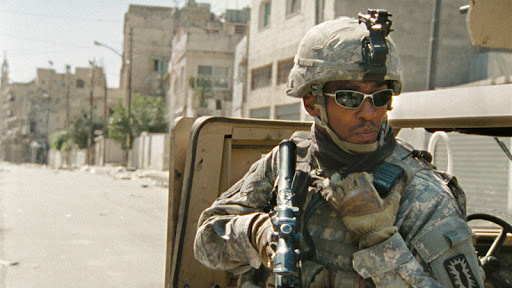 I’m not sure why it took me so long to see The Hurt Locker but absolutely that anyone who hasn’t seen it yet do so. The special features on the Blu-ray include a Behind the Scenes featurette; interviews with Jeremy Renner and co-stars; a backstage segment describing the filming conditions in Jordan; and a visually stunning photo gallery. The cinematography is absolutely incredible in this film and credit goes to Barry Ackroyd and directed Kathryn Bigelow for his realisation of her vision. If, like me, you were unfortunate enough to have missed this film in the cinema then this is a perfect film for Blu-ray. This is a film that immerses the viewers, almost assaults them with a shock of sound, colour, sweeping desert vistas and music. The DTS-HD Master Audio 5.1 is impressive and was brilliant on my surround sound system. I jumped out of my skin at that first explosion as the sound felt like it had come from behind me. The video is 1080p MPEG-4 AVC and is absolutely crisp. Adding to the overall experience is the musical score by Marco Beltrami and Buck Sanders that is expertly woven into the scenes. There were no great orchestral sequences but the score certainly caught my attention as it is quite beautiful. This fantastic score certainly deserved the Academy Award nomination for Best Original Score. 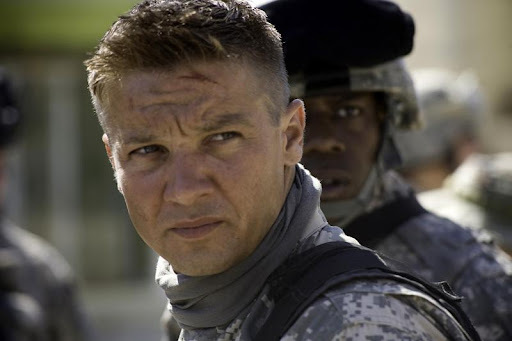 Jeremy Renner, Anthony Mackie and Brian Geraghty gave outstanding performances as the three members of the unit and Jeremy Renner certainly deserved his BAFTA and Academy Award nominations for Best Actor. It has been a long time since I have seen a film that has impressed me as much as this film and I cannot fault the acting, cinematography, direction, musical score, screenplay or story. The last time I unreservedly gave a film a score of 10/10 was two years ago when I watched Slumdog Millionaire. I have no hesitation in giving this film full marks and I will definitely be watching it again in the future. I heard a lot about this movie, and even bought its dvd, but I was so disappointed. It was not as good I expected. @ Self Sagacity: It's a pity you didn't like it. I thought it was really powerful and really blew me away.